Children's' Liturgy of the Word every Sunday! 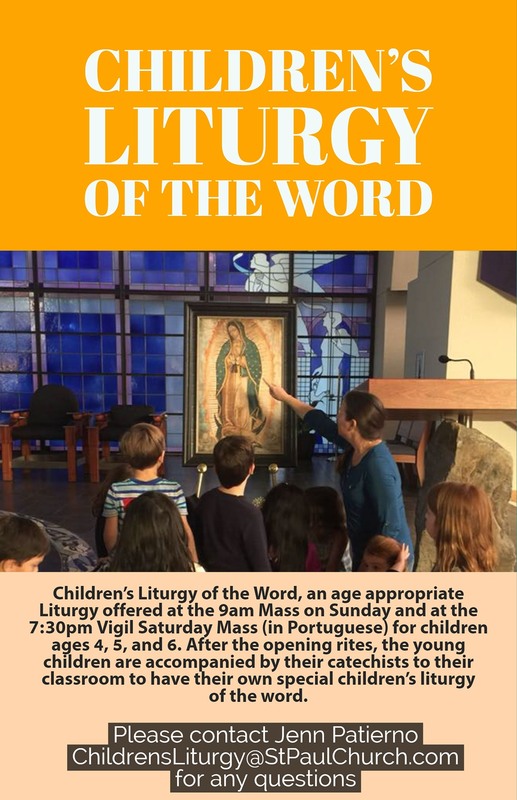 Our young parishioners, ages 4 through 6 years of age attend the Children’s Liturgy of the Word at our 9:00 a.m. Mass and at our 7:30pm Vigil Mass on Saturday. They are called forward during the Liturgy of the Word to process out of church with their catechists and listen to the Sunday readings from the Children’s lectionary. They return to church following the Prayers of the Faithful. We are grateful to our volunteer catechist who bring this ministry to life. We welcome more adult volunteers. If you would like to learn more about this ministry please contact the Parish Office to speak with Jennifer PAtierno at ChildrensLiturgyStPaulChurch.com. Spanish Children's Liturgy of the Word Coming Soon!